A true story of corruption, greed and lust for power. Names, dates, places, times, lies, legalized bribery, influence peddling, corrupt government agencies, bad drugs and bad people. While investigating statins, we were faced with big words like “3-Hydroxy-3-Methyl-Glutaryl Coenzyme-A reductase”, sometimes shortened to “HMG-CoA reductase” or better yet “reductase”. What to do? To be understood, this report had to be simple. Here is simple: we got shafted. The NIH and associated agencies blew over a half a billion dollars of our money. The FDA may as well have not existed. We have been lied to, stolen from and poisoned by the pharmaceutical industry. No surprises here; business as usual. Another part of biochemical language became apparent. Biochemistry is riddled with words and phrases like, “may, might, could, this might mean, putative (supposed), pleiotropic (many) and unknown mechanism”. The chemist might describe it something like this: “a proliferation of putative, pleiotropic inexactitudes”. Is biochemistry an inexact science? No. It is a science of proven results that are reproducible, consistent and understandable. When it comes to approving drugs for profit it is easy to obscure proven results with caveats like “may or might or unknown mechanism”. After all, that is the language of biochemistry. When seeking FDA approval, those words become the lies of the pharmaceutical industry. Those words are honest words for unproven science; those are words that cannot be trusted when money is involved. When it comes to drugs versus sound science, absolute science can be quickly obscured by the smoke screen of relative statistics. Statistics don't lie, but liars use statistics. Conflicts-of-interest become the enemy of a universally accepted proven scientific body of evidence. Absolute truths are buried by relative lies. All of lipid theory “evidence” linking cholesterol to cardiovascular disease is based on relative statistics. True believers like Steinberg have agendas. True believers are a dangerous lot. They fought on both sides in the crusades and presided over the Spanish Inquisition. They brought the Nazis to power in Germany and brought down the twin towers on 9/11. Steinberg and his comrades are the true believers of this report. They skewed the statistics to save us from ourselves – even if it kills us. They are like the religious right that brought us prohibition, Al Capone, segregation and lynch mobs. Scientists free of hidden agendas like Siperstein had proven statins were deadly long before a corrupted FDA approved them. Steinberg infected his colleagues and convinced the FDA that a deadly fungal toxin was good for all of us. The drug companies that sell statins benefit from relative statistics used to obfuscate hard science. They dress it up with phrases like “evidence-based medicine”, “peer-reviewed report” and “double-blind study.” Dress up a pig, it is still a pig. Misuse of statistics is a malignant cancer on medicine. Two hundred million users at $2 per toxic dose and $400,000,000 per day yields enough gross resources to hire a whole army of ghostwriters to publish bogus claims and bury absolute science with relative statistics. This “malignancy” props up a $146,000,000,000 per year windfall to the drug industry—all built on lies. This report tracks the liars and the lies about one of the statin drugs (lovastatin) from one of the drug companies (Merck). This is because lovastatin was the first of all the currently prescribed statins and Merck is responsible for its approval. Statin research was founded on scientific assumption and an agenda. Statins are dangerous drugs developed in error for profit. 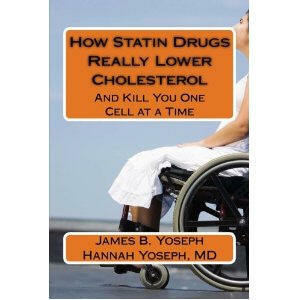 Scientific evidence had proven that statins were lethal years before lovastatin’s approval. Merck corrupted the science and the scientists. The approval process was so corrupted by Merck that lovastatin was bound to be approved. The FDA shirked its duty; neither safety nor efficacy was proven for statins. There is no credible proof that high blood cholesterol and cardiovascular disease (CVD) have a causal connection. Diet and exercise do not help. There is no good reason to prescribe statins to anyone. If there was any justification for lowering cholesterol from NIH's $500,000,000 studies, and a safe way could be found, it should be administered to only one small group of men aged 28 to 45. The entire myth was built around that group. Irrefutable, reproducible science proves statins are deadly and LDL cholesterol is vital for life. Universal biochemistry convention proves statins kill organs and organisms, one cell at a time. 1957: Japanese biochemist Akira Endo graduates from Tohoku University and joins Sankyo Pharmaceuticals in Tokyo. He receives a PhD in 1966 from Tohoku for his work at Sankyo. 1959: FDA approves MER/29 as the first cholesterol-lowering drug that blocked the mevalonate pathway and is an instant success. 1959-1961: Multiple reports are published hailing the benefits of MER/29 for lowering cholesterol. 1961: A MER/29 lab worker complains to her husband that lab animal data is falsified. Her husband, who car-pools with an FDA investigator, reports his wife's complaint. FDA performs an unannounced record search. 1962: MER/29 is removed from the market after FDA discovers the William S. Merrell Company had omitted preclinical findings of cataracts in rats and dogs, muscle wasting in monkeys and other falsified or unreported data. 1963: A federal grand jury indictment is issued against Merrell Co. and some of its employees. Scientists and executives plead “no contest”, which protects them against the grand jury findings in subsequent class-action civil suits. Multi-millions are awarded to the victims. 1960-1975: Drug companies enter the “mycotoxin gold rush” after a fungal toxin (aflatoxin) was found to cause cancer epidemics in grain-fed domestic trout and turkeys. 1970: Marvin Siperstein publishes his discovery that aflatoxin disrupts cholesterol synthesis in cells. 1971: Endo searches for cholesterol-lowering agents from fungal mycotoxins. 1976: Endo extracts citrinin, a disease-causing mycotoxin from Penicillium citrinum. He discovers that citrinin lowers blood cholesterol and publishes his report. 1976: Endo abandons his work with citrinin because it is too toxic. He extracts another mycotoxin from Penicillium citrinum called “ML-236B” which proves less toxic than citrinin and also lowers blood cholesterol. ML-236B becomes the first experimental statin. 1976: Endo contacts Dr. Goldstein at a Dallas-based Merck supported lab. Goldstein expresses interest in ML-236B. 1976: Merck contracts with Sankyo for the disclosure of information on ML-236B. Sankyo believes that both companies will jointly develop ML-236B. 1977: Endo, Brown and Goldstein publish a paper documenting how statins cause an increase in reductase. Statins are yet called “reductase inhibitors” instead of “reductase stimulators”. 1978: Merck develops their own statin. Sankyo cancels work with Merck. Endo leaves Sankyo. 1979: Endo patents another statin and sells it to Sankyo. 1979: Brown and Goldstein's mentor, Marvin Siperstein, co-authors a paper with astronaut Millie Hughes-Fulford. They explain how Endo's statin blocks DNA replication in cells and kills them. 1980: Brown and Goldstein co-author a paper explaining how statin-fed cells mutate and make more reductase or die. 1980: Sankyo cancels clinical trials on humans after half their lab dogs develop cancer. 1980: After receiving news of Sankyo’s decision to stop statin development, Merck calls Sankyo. Sankyo refuses to talk with Merck. Merck stops statin development. 1981: Brown and Goldstein report on cell mutations induced by statins. 1982: Under arrangements approved by the FDA, Merck makes lovastatin available to Grundy, Bilheimer and Brown at Dallas for FH patients who had failed known treatment modalities. An IND (Investigational New Drug) permit is granted for human experimentation in Dallas. 1984: Merck applies for an IND for lovastatin and a new drug application (NDA) is approved in nine months – one of the shortest approval times for the FDA since MER/29. 1985: The NIH launches the National Cholesterol Education Program (NCEP). Steinberg positions his colleague Grundy to chair the NCEP. 1985: Merck consultants Brown and Goldstein receive the Nobel Prize in Medicine for statin-related research. Their papers no longer report on statins’ deadly effects. 1987 (February 19): Brown and Steinberg represent Merck at the FDA advisory committee meeting on lovastatin. There is no disclosure on the increase in reductase and resultant cell injuries from mevalonate deprivation that are said, by Merck's MacDonald and Tobert, to be due to an unknown mechanism. 1987 (August): Lovastatin is FDA approved. 1987 (October): NCEP publishes cholesterol (statin) treatment guidelines in the American Heart Association’s (AHA’s) widely read “Circulation” magazine. The president of the AHA, Tony Gotto, is Merck’s consultant. 1990: The NIH convenes a panel to discuss the possibility that decreasing cholesterol levels might be intrinsically dangerous. The panel concludes that the evidence cannot be ruled out but dismisses it anyway. 2001: Bayer's “super-statin” Baycol is recalled after multiple deaths are attributed to the drug. Today, statins remain the most insidiously dangerous and best-selling drug in the world. In this book, “cardiovascular disease” is abbreviated as CVD. CVD includes coronary heart disease, atherosclerosis (hardening of the arteries), heart failure, high blood pressure and stroke. One author is a medical doctor; the other is a carpenter. BRING THIS BOOK TO YOUR ATTORNEY! Seventy million Americans and over two hundred million people worldwide are taking a deadly drug called statins. How did this happen? Whose fault is it? The record reads like an Edgar Allen Poe novel. It did not start with some grand conspiracy. It became one. It was an insidious creeping cancer, a combination of events and history. It was capitalism running amuck. It was the rise to power of one true believer. It was competition and greed. It was corruption of good science and good scientists. It was deregulation of the FDA. It was pride and prejudice and the residual of WWII. It was a poison so tiny it went unnoticed. It crept into the culture in the name of good and infected everyone it touched with evil. By 1930, cardiovascular disease (CVD) had become the leading cause of death of Americans. It was an enemy to be stopped. In 1913, a Russian scientist named Nicolay Anitschkow released a study that grass-eating rabbits developed CVD when force-fed an all-cholesterol diet. The evil seed was planted. When WWII broke out the “Japs” became America’s archenemy. Movies, news articles and newsreels portrayed them as diabolical “slant-eyed” demons. It was a national agenda: “Beat the Japs”. The residual prejudice of that war would play into the development and widespread acceptance of statins. In 1948, the largest tax-paid study ever mounted on heart disease began in a small town called Framingham. The cost of it would eventually amount to hundreds of millions of dollars. It was established on a flawed agenda. It set out to prove the relationship of high LDL cholesterol to heart disease (the lipid theory). It failed. But millions of taxpayer dollars had been spent and reputations and jobs were on the line; it had to succeed. The evil began to grow. The Framingham study proved that if you were male, between the ages of 28 and 45, lived in Framingham and had high LDL cholesterol levels, you had a 2% greater chance of dying from a heart attack or stroke than the national average. On that one statistic a national health agenda began: stamp out high LDL cholesterol in everyone. The lower the better. The evil began to spread. In 1957, a young Japanese scientist named Akira Endo graduated from Tokyo Noko University and joined Sankyo – a Japanese drug company. His part in the coming travesty would not be known until much later. In 1959, the William S. Merrell Company pushed through the FDA, in record time, a drug called triparanol (MER/29). It lowered cholesterol by blocking the same biochemical path as statins. Cataracts, skin lesions, hair loss, impotence and neuropathy began to develop in the patients. Whistle-blowers came forward. Merrell Co. had lied and withheld information pertinent to approval. Heads rolled, people were convicted, lawsuits abounded and the drug was withdrawn in 1962. MER/29 was a hugely profitable and popular drug. Steinberg hails Nikolai Anitschkow as the first lipid theorist worthy of the Nobel Prize – having supposedly first proved that LDL cholesterol is the cause of heart disease. He would spend hundreds of millions of taxpayer dollars on the CPPT (Coronary Primary Prevention Trial). It failed. Undaunted, he would manipulate the statistics to be right regardless the true results. That had already been done with the Framingham study. He perverted an absolute statistic of less than two percent in the CPPT study into a 19% relative statistic. He then declared the cholesterol wars over and the lipid theory factual science. He gathered like-minded true believers and formed the NIH “consensus panel” on cholesterol. In 1980, statin development came to a screeching halt due to cancer in Sankyo’s lab animals. Daniel Steinberg and Akira Endo would resurrect its development. In 1981, Endo published the results of clandestine human studies in Japan. Steinberg consulted Merck and the FDA, discredited Sankyo’s findings of cancer in more than half their statin-fed dogs and helped pave the way for starting human trials in the U.S. so as to beat Japan in a “knock-down drag-out race” – an ugly leftover from WWII. In 1982, human studies began on Merck’s lovastatin at a university in Dallas using NIH grant funds. The taxpayers would pay for Merck’s trials. In February 1987, Daniel Steinberg, the former NIH chief turned Merck’s advisor, would be the first speaker at the FDA advisory committee meeting on statins, held at the NIH. In August 1987, the FDA approved lovastatin. In October of 1987, the National Heart, Lung and Blood Institute (of the NIH) launched the largest free advertising program ever devised: the National Cholesterol Education Program (NCEP). Steinberg again led the way. At taxpayer expense, Americans were screened and 25% prescribed statins to take the rest of their lives. The taxpayers would pay another 150 million dollars to advertise for Merck. Steinberg would brag of his involvement in his later writings. The evil had overcome the land like the creeping vines of Japanese kudzu had swept over southern farmlands and immersed them in a tangled impenetrable web. Even leeches and bloodletting have proved more useful and safe than statins. Never in the history of medical science has one man and his followers done so much harm to so many. Steinberg et al. have been beating a dead horse. The myopia of their dead science and findings have harmed and killed too many to count. Akira Endo is another dangerous and driven man. There was only one thing certain about Anitschkow’s rabbits: they are natural vegetarians that do not normally suffer cardiovascular disease. The cholesterol they were fed was never the enemy. The quantum leap that even Anitschkow did not make linking cholesterol to heart disease was not just bad science. It was, and remains, insane.